Black Ice Software - BiBatchConverter 4.26 and Document Converter Server 1.09 is released! Redesigned Text Output user interface, and dozens of new features! Black Ice Software has released the BiBatchConverter 4.26 and Document Converter Server 1.09 with a completely redesigned Text Output user interface. The new user interface centralizes every text extraction relevant feature on the Text Output Tab of the Printing Preferences, allowing users to configure the text output and access every relevant feature more quickly and easily on a single Tab! Text with layout - New formatting style to keep the original physical layout, indented, alignment and spacing. Line break format - To specify the format of the line breaks in the generated text output. Output Directory Settings - To specify different location for the generated text output files. Automatic space detection and glyph conversion options for improved text output. New actions if the text output file already exists to append, overwrite the existing file, or to rename the new file and keep the already existing text output. BiBatchConverter 4.26 and Document Converter Server 1.09 also includes new option to Overwrite output document if the document is already exists, and updated documentation. 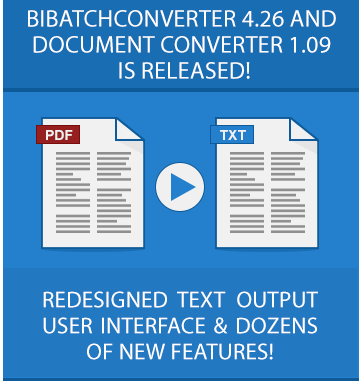 Download the Latest BiBatchConverter and Document Converter Server!